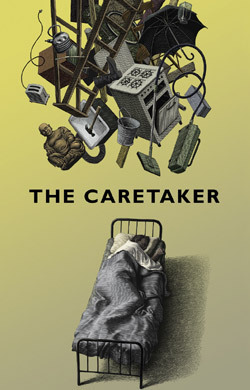 The Roundabout Theatre Company’s current production of Harold Pinter’s The Caretaker could not be better in every respect. It’s superbly acted, staged and set. Patrick Stewart of the wondrous voice looks too well bred to be the derelict caretaker. He’s called Mac Davies, or maybe Burt Jenkins–having two names suits his paranoiac understanding of himself and the world. For wiliness, deviousness and cunning at insinuating himself in a new room and finding a protector, Davies knows all the ruses of a professional parasite. Aston (Kyle Maclachlan) found Davies in a cafe and offered him lodging and money until he gets "himself sorted out." Of course, that never will happen. Davies takes possession of Aston’s place, a bleak room with twin beds, junk piled on junk, a bare light bulb suspended from a leaky ceiling, and a paper tarp over the window. He complains about the room in a febrile whine: he’s used to much better, he’s going to collect his "belongings" off in Sidcup as soon as the weather breaks, as soon as he gets some shoes and sorts himself out, and so on. He cannot leave, though he runs out of excuses why. Stewart’s Davies moans, snivels, croaks with belligerence and the tyranny of the weak, making himself not merely annoying but thoroughly unappealing. Aston’s brother Mick (Aidan Gillen), on stage at first rise, is top man in the room’s pecking order. Mick is not taken in by Davies, who therefore is deeply fearful of him. Pinter gets these three interacting in psychological power games, ranging in importance from slight and funny to dark and menacing. It’s not plot that concerns him, but situation; not what has happened, but what is happening. It has taken a generation since the play first appeared in May, 1960 for audiences to catch on to this blueprint for Pinter’s drama: it’s not about a theme, an idea, or motif. His drama &#145;is’ that theme or idea. The men’s jostling for position, the put downs, the impersonal free-floating hostility, most of all the uncertainty surrounding the who, what and why of these characters may be more important than the overall action, minimal as it is. Davies in this regard is only marginally more important a character than the brothers. He tries and fails to play them off one another, but in the end both reject him. If they symbolize parts of the psyche, as one critic claimed long ago, then Davies probably represents a massive, violent id. At one point when verbally attacked, he pulls a knife. Mick and to a lesser extent Aston are versions of that Pinter type whose detachment and disinterest are sources of power. Action and reaction never arouse emotional responses. Aston especially typifies Pinter’s style of dialogue in which one character repeats the other’s statements flatly, insistently, wearing down resistance and creating an atmosphere of unease. Mick might be Goldberg (The Birthday Party) or Lenny (The Homecoming), two of Pinter’s Inquisitors. Their disjointed talk is in equal part absurd, hilarious, yet heavy with larger meaning that nonetheless remains opaque. Like his avatars, Mick grinds down Davies’ ego by keeping him off base, questioning his presence, his every word, especially his claim to own a "bag of belongings" that would establish his identity in the world, if only the bag were not elsewhere. Mick intimidates and taunts him, withholds his clothing, keeps him vulnerable and on edge, deliberately misunderstanding every word by shifting the assumptions behind ordinary language. Thus is Davies under siege. Uncertainty grows. The poor sod yearns for clarity, becomes increasingly uncomfortable, then bewildered, then furious at the politely overbearing brothers. Yet, despite his victimization, Davies rejects their offers of betterment. Aston tries to give him shoes, for example and Mick casually offers him the job of caretaker of the house&#150;perhaps to maintain his slippery control over the present, albeit on the fringe of dilapidation. Davies prefers his independence, though he presents an image of dislocation, dispossession, and spiritual homelessness in an orderly country. And sure enough, Mick, in a stunning final scene, indicts the wretch in one of Pinter’s typical perorations–biting words spoken in a cool, remote tone of voice. He damns Davies as a liar, "Violent, erratic, nothing but a wild animal," heaping insult on humiliation, flinging a half dollar at Davies’ feet to pay him off for nominal care-taking. Nor does Aston come to Davies rescue, though he tries to revive Aston’s earlier good graces. "I’d look after the place for you…not for your bother…I’ll be your man, just say the word…" But playing benefactor no longer interests Aston. There is no reason in Pinter’s world to expect continuity in human behavior or predictability or reliability. Aston’s earlier assault of Davies recalls Goldberg’s relentless interrogation of Stanley in The Birthday Party that leads to Stanley’s breaking down and hospitalization. Aston, meanwhile, joins the ranks of Pinter characters familiar with mental wards. The longest speech in The Caretaker is Aston’s tale of hospitalization for hallucinations and catatonic behavior. In a moment when Davies has the upper hand in their power play, he threatens Aston with return to the place with its electro-shock and other treatments involving "pincers at the temples." Beyond these vague references to psychosis, a mass unconscious almost surfaces in the action, especially in a mysterious moment of darkness, when Mick changes the burned out, naked light bulb. A scuffle and a vacuum cleaner are heard before lights up on Aston, who announces the place needed cleaning up. The symbolic double meaning of outer and inner room could not be clearer. Ratty twin beds and a tall heap of junk make the furnishing of this room, which overall looks decrepit enough to generate the characters’ daydreams of palaces and exotic places. Mick is quite moving on the subject. Indeed, the acting by all three of these well seasoned players is consistently superb. Also, David Jones, the accomplished director, is to be congratulated for keeping the staging intelligible. There was no unnecessary moving about for the sake of motion to "fill up" a stage, an irritating feature that often mars productions of small cast plays.